from My Bread: The Revolutionary No-Work, No-Knead Method, pp. 77-75. Forgive this cookbook’s subtitle that promises no work. I’m sure Lahey had nothing to do with it. Revolutionary, yes. No-knead, yes. No work? Not quite. Nevertheless, Lahey’s new book has taken up permanent occupancy on the shelf where I keep the cookbooks I use constantly. Now that I have made three breads from the book, I have come to appreciate the recipes and the specific advice the author gives. For instance, he cooks his breads in a very hot oven (475 F). But he also says that home ovens can vary so much that those who use his book have to decide for themselves where their oven works best for the bread. The acceptable range runs from 425 F all the way to 500 F. My oven, I’ve decided, works best for bread at either 425 F or 450 F, but not higher. 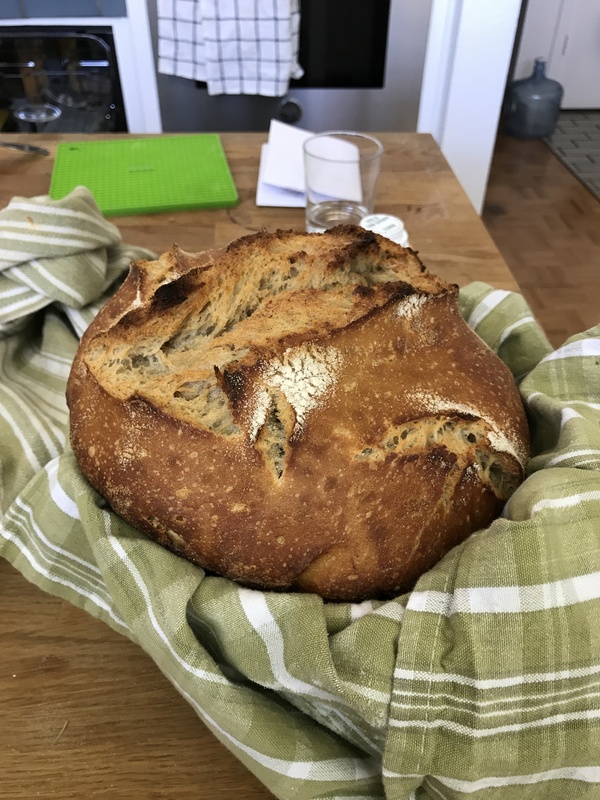 Even if you’re devoted to the version of Lahey’s No-Knead Bread offered by Mark Bittman in his column a couple of years ago, your technique will improve and your options will double if you use this book. The recipes, however, differ subtly from Bittman’s and Cook’s Illustrated adaptations of the Slow-Rise Bread. I find the doughs in Lahey’s book wetter than the imitators, which is no bad thing. That’s partly what makes the crust hard. It means you have been handle the dough more carefully. The crust on all three of the breads turned out hard. When I pushed my thumbs into the bottom of a roll to break it open, the crumb displayed a beautiful constellation of air holes. My only quibble about this particular recipe concerns amounts. 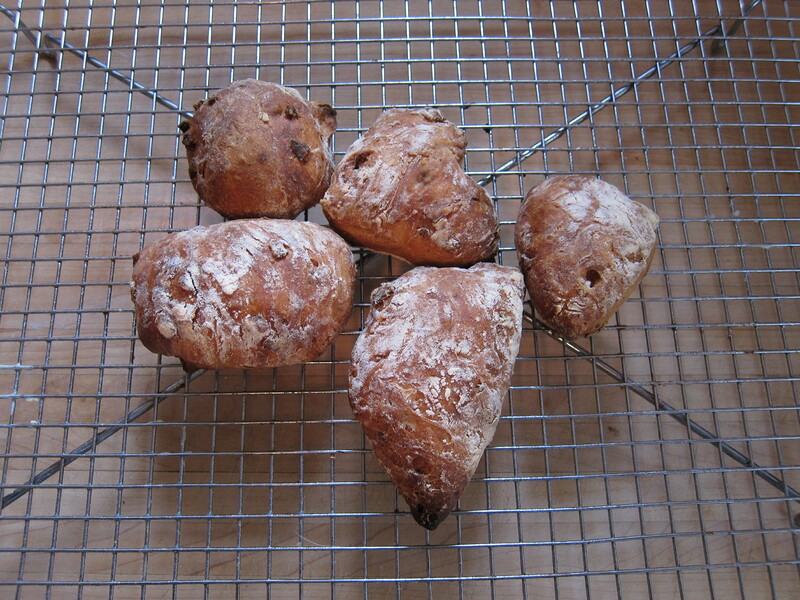 Lahey recommends doubling the Pancetta Bread recipe and cutting the twice-risen dough into twenty balls. I made half the Pancetta Bread amounts and cut the dough into 5 balls. They seemed a little small to me. Plus, I found the pancetta amounts a little on the skimpy side. But don’t err in overcompensating! Shadowcook: I used a scant teaspoon of kosher salt. 1. Cook the pancetta or bacon in a heavy skillet over medium heat, stirring occasionally until crisp and golden, about 10 minutes. Reserve 1 tablespoon of the fat. Drain the pancetta on paper towels and let cool. 2. In a medium bowl, stir together the flour, pancetta, salt, yeast, and red pepper flakes, if you’re using them. Add the water and reserved rendered fat, and using a wooden spoon or your hand, mix until you have a wet, sticky dough, about 30 seconds. Cover the bowl and let sit at room temperature until the surface is dotted with bubbles and the dough is more than doubled in size, 12 to 18 hours. Shadowcook: Remember, it’s likely to be a wet dough, so don’t worry. If it isn’t wet, you’re still okay. 3. When the first rise is complete, generously dust a work surface with flour. Use a bowl scraper or rubber spatula to scrape the dough out of the bowl in one piece. Using lightly floured hands or a bowl scraper or spatula, life the edges of the dough in toward the center. Nudge and tuck in the edges of the dough to make it round. 4. Place a tea towel on your work surface and generously dust it with wheat bran, cornmeal, or flour. Gently place the dough on the towel, seam side down. If the dough is tacky, dust the top lightly with wheat bran, cornmeal, or flour. Fold the ends of the tea towel loosely over the dough to cover it and place it in a warm, draft-free spot to rise for 1 to 2 hours. The dough is ready when it is almost doubled. If you gentle poke it with your finger, it should hold the impression. If it springs back, let it rise for another 15 minutes. Shadowcook: Because this dough has the potential of being wetter than the Slow-Rise Bread dough, make sure you do generously flour both the work surface and the tea towel. The first time I made bread from this book, the dough stuck to the tea towel when I tried to flip it into the heated Dutch oven. In this recipe, it is a problem, since you’ll be making balls and placing them on a baking sheet. 5. Half an hour before the end of the second rise, preheat the oven to 475 degrees F, with a rack in the lower third. Oil a baking pan. Transfer the dough onto a generously floured work surface. Cut the dough mound into two strips and break each strip into five equal pieces. Each piece should weigh 80 grams. Round each piece into a roll-shaped ball. Place the balls on the pan in even rows. Bake for about 40 minutes, until the rolls are dark brown. Place them on a rack and allow them to cool thoroughly. Shadowcook: If your oven runs hot, place the rack in the middle. Weigh the dough. It helps to make the balls of equal weight. 40 minutes was too long for my oven. And 475 degrees is too hot. Next time, I’ll try 450 for 40 minutes. If that doesn’t work, then 425. Last word of caution: keep your hands off of them for a full hour after they come out of the oven! It makes a difference to the texture of the crumb.